The only thing worst than getting an error is getting an error and not knowing what error it is and where it is. This is not a common problem but every Android developer is susceptible to it. Your app might just crash without any error or without the common "Unfortunately the app has closed" message. In some cases the app is redirected to another activity after an activity has crashed. The errors are there, they are being output but they are not being displayed to you. 1. Remove filters - This is the most common and simple mistake that developers make that hides the error logs from them. The logcat might have filters set that are not allowing the error logs to be shown, you can set it to only from your application or remove all the filters. I had once wasted a whole lot of my valuable time just because of this simple issue. 2. Remove noHistory property of Activity in Manifest - This is not actually a crash. It's how the app is supposed to work if you have set the noHistory property in the Manifest to true. This property defines whether or not the activity should be removed from the activity back stack and finished when the user navigates to some other activity from it and it's no longer visible on screen. 3. Run in debug mode - You can try to run the app in debug mode. 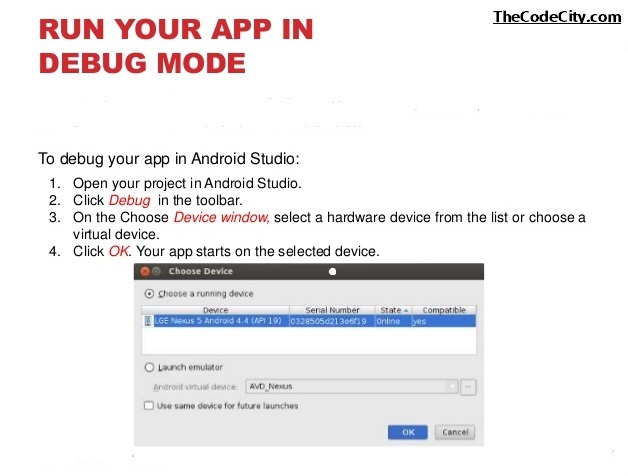 Android Studio has a debugger that enables you to debug the apps on the either the Emulator or any connected Android device. Here's how you can enable debugging mode in android studio, to start debugging, click Debug in the toolbar. Android Studio builds an APK, signs it with a debug key and installs it on your selected device. It is then run and the Debug window is opened for analysis. So I hope you can now finally see the details about your error in logcat and your app now crashes with error, developers have strange wishes sometimes :-P . Do let me know how it goes in the comment section below! Cheers!